The most shocking result of having researched the causes of the financial crisis for the last year and a half is this discovery: economists have no compunctions about answering empirical questions, such as what caused the specific crisis of 2008, with general theoretical models, whether macro- or micro- in nature, that may or may not have any applicability to the actual historical event at hand. The possibility that a good model may not be applicable in a specific circumstance never seems to cross their minds. Or, to put it differently (since we all use models): economists seem particularly uninterested in testing their hypotheses against evidence. Why do that, if all economic models express "universal laws"? During the first year after the peak of the crisis in September 2008, however, a positive side effect of the economists' apriorism was that it produced several different hypotheses that, in this case, were relatively easy to test against evidence. For instance, there was the Austrian business-cycle theory. But it runs up against two (not necessarily fatal) questions when it is applied to the specific crisis at hand: "Why housing?" and "Why a banking crisis?" I.e., if low interest rates were the cause of the crisis, why wasn't there a general overinvestment in capital goods, as the Austrian theory predicts? In fact, there was an overinvestment in housing, a labor-intensive good with a short production period (roughly 3 months). Why not, instead, an overproduction of jet airplanes or skyscrapers? One may supplement the Austrian theory with explanations such as Stephen Gjerstad and Vernon Smith's Critical Review focus on the favorable tax treatment given to home-equity capital gains, or Peter Wallison's Critical Review focus on federal housing policy, which, via Fannie Mae and Freddie Mac, added to low interest rates even more favorable terms for home buyers (e.g., no down payments). But then we aren't really talking about a specifically Austrian theory any more: nearly everyone, of every theoretical stripe, blames low interest rates as a facilitating condition of the crisis. And while low interest rates may (perhaps) have been necessary, they were not sufficient, to cause the crisis. And they did not operate in the specifically Austrian fashion of boosting spending on more "roundabout" methods of production. Moreover--why should a housing crisis have turned into a banking crisis? Brian S. Wesbury's new book, It's Not as Bad as You Think (Wiley 2010), demonstrates that the collapse of housing did not cause the recession. It was the banks' overinvestment in mortgage-backed bonds, whose value was called into question during the panic of September 2008, that caused the recession--by freezing bank lending. There is no known macroeconomic explanation for the banks' purchases of these bonds; so it must have been caused by institutional or microeconomic factors. Nonetheless, some "Austrians" continue to push "the Austrian" theory, even though that theory is but a minor aspect of the rich Austrian legacy. Back when I received an informal education in Austrian economics in New York City in the mid-1980s (via Israel Kirzner and Don Lavoie), and then, more intensively, through editing them and virtually every other Austrian economist in Critical Review in the early 1990s, Austrian business-cycle theory was seen by Austrians as an embarrassment. The distinctive thing about "Austrian" economics, it was thought, was not business-cycle theory but the Austrian focus on human ignorance. This focus is evident in the best explicitly Austrian books ever written: Lavoie's Rivalry and Central Planning: The Socialist Calculation Debate Reconsidered (CUP 1985) and Mario Rizzo and Gerald P. O'Driscoll's The Economics of Time and Ignorance (2nd ed. Routledge 1996). This tradition continues with Amar Bhide's forthcoming masterpiece, A Call to Judgment: Sensible Finance for a Dynamic World (OUP 2010), which attributes the crisis to the spread of mistaken theories of finance, such as the Capital Asset Pricing Model. Karen Vaughn's Austrian Economics in America (CUP 1998) is a challenging, exciting history of this epistemically oriented Austrian economics, now largely abandoned. Most Austrians have now, sadly, adopted (perhaps due to the influence of Public Choice theory) the mainstream economists' obsession with rational-choice game theory (the strategic interaction of knowledgeable self-interested agents), which tends to reduce error to perverse incentives rather than genuine ignorance. So all that Austrians have left to distinguish themselves from the mainstream is Hayek's old business-cycle theory, which may or may not explain some business cycles but does not seem sufficient to explain this one. Meanwhile, non-Austrian economists have gravitated toward two game-theoretic "moral hazard" stories that fit with their predisposition to reduce human error to misaligned incentives. First, the moral hazard of "too big to fail" (TBTF). Empirical problem: Before the bailouts, nothing of this scale had ever happened, so no bank could have been sure they would be bailed out. And if one actually reads accounts of the decision making in the years leading up to the crisis, such as Gillian Tett's Fool's Gold and William D. Cohan's House of Cards, no decision makers factored bailouts into their calculations. Why? Because they didn't think they were doing anything particularly risky (an ignorance-based human error), so they didn't even consider the chances of being bailed out. Second, the moral hazard of "corporate compensation systems," i.e., bonuses. Empirical problem #1: When this theory took hold, there was virtually no evidence for it (whereas now there is one study for it and one against it)--see Wladimir's and my post on the topic (below). Empirical problem #2: There was, and remains, the following overwhelming evidence against the theory: 93% of the banks' mortgage-backed securities were either guaranteed by the U.S. government (i.e., Fannie and Freddie) or were rated AAA--the "safest" and lowest-yielding securities available. Triple-A bonds are the last thing revenue-seeking, bonus-hungry, risk-indifferent (i.e., risk-knowledgeable, rather than risk-ignorant) bankers would have bought. Yet now the Corporate Compensation Myth is the hegemonic story of the crisis, all but universally accepted by financial journalists, politicians, regulators--and scholars. Why? Because it fits the scholars' rationalistic predilection for incentives stories that reduce an apparently widespread error to the knowing, deliberate actions of selfish actors--i.e., "greedy bankers." And guess what? That is exactly the simplistic model that journalists, politicians, and the general public are inclined to believe, evidence or not. Nominal expenditure falls, and I explain it by an imbalance between the quantity of money and the demand to hold it. As for Austrian theory, malinvestment does seem to be a significant part of the current crisis, and while simple stories of round about methods of production may not apply to building a house, building a lumber mill so that someone may live in a house 50 years from now (and 49, and 48 down to next year too) is a round about production technique. I don't think monetary policy mistakes in the naughties were all that important to explaining all the malinvestment in housing, but that there really needs to be an reallocation of labor and that new types of capital goods need to be built to replace inappropriate ones, and that this will negatively impact the productive capacity of the economy for some time--well, that seems to be important. This is a real category mistake -- based on a grossly false picture of "science". 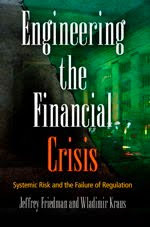 "The most shocking result of having researched the causes of the financial crisis for the last year and a half is this discovery: economists have no compunctions about answering empirical questions, such as what caused the specific crisis of 2008, with general theoretical models, whether macro- or micro- in nature, that may or may not have any applicability to the actual historical event at hand. Or, to put it differently (since we all use models): economists seem particularly uninterested in *testing* their hypotheses against evidence." In Hayek housing is a _long term_ capital good. If you are going to attack Hayek's work, it helps to know it. "I.e., if low interest rates were the cause of the crisis, why wasn't there a general overinvestment in capital goods, as the Austrian theory predicts? In fact, there was an overinvestment in housing .."
Every "Austrian" I know believes there are multiple explanatory elements involved in the 2003-2010 boom and bust. First, the moral hazard of "too big to fail" (TBTF). Roger Koppl has articulated a variation on the essence of this problem with his "big player effects." What might be "too big to fail" is the idea that a hegemonic regulatory body, bank, etc. ought be kept afloat to prevent the system from suffering a severe lack of faith. They bought AAA not because they were safer, but because of regulatory arbitrage. I can't tell if you are for or against the Austrians. In any case, it doesn't really matter. A housing crises turns into a banking crises because of the toxic mortgages on the banks balance sheets. Seems pretty simple to me. People default, banks fail due to credit contraction after they have to write-off the debt. People buy houses with loans, the banks and mortgage lenders provide those loans. I don't understand why you don't understand this. Why the Greek Debt Panic?